"In a speech marking 40 years since the improvement in ties with Taiwan, Chinese President Xi Jinping has has once again called for peaceful reunification, also warning that China reserves the the right to use force. Although it is self-governed and de-facto independent, Taiwan has never formally declared independence. Xi also said that reunification is "an inevitable requirement for the great rejuvenation of the Chinese people" and that his government "reserves the option of taking all necessary measures" against outside interference with peaceful reunification…." Not a hopeful balance. Then again, I seem to remember an old joke about Germany and the Swiss. Bismarck said something like "You (the Swiss) have an army of 20,000 men, what if I sent 40,000 Germans against you?" The Swiss ambassador's reply was "Each man would fire twice." Well, it is closer than I thought. The transport capabilities will be a major factor. 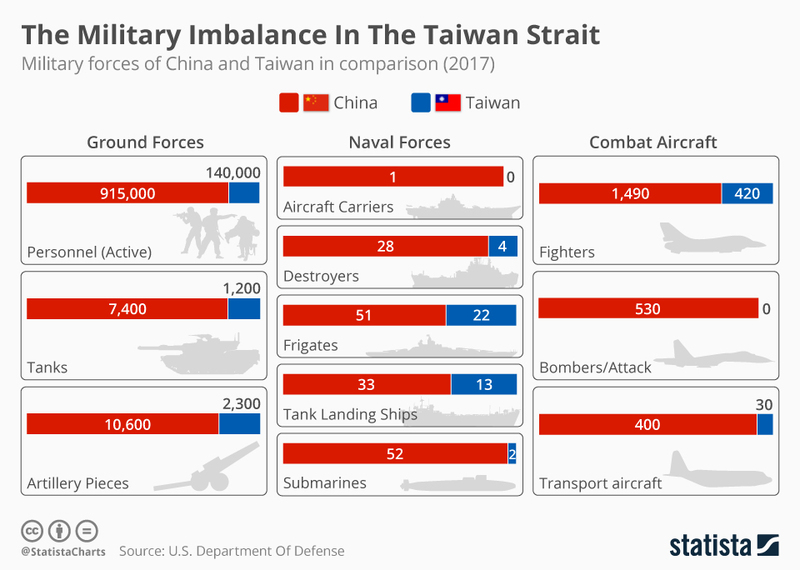 With a naval strategy of attacking transport ships and not combat ships the Taiwan army would severely limit Red Chinese reinforcement and expansion capabilities. The Taiwan strategy would be defensive so many of the disparages are not crucial. The Chinese would still have military responsibilities in other region while Taiwan would not. So the numbers in manpower is closer still. PRC has about a 3:1 advantage in the number of fighter aircraft. Query whether the PRC could actually get and keep all of them in the air at the same time. Moreover, if the ROC fighters are technologically superior, they may defeat the remaining PRC fighters. Then PRC air and water transports become targets for those same ROC fighters. That will at least delay an invasion. PRC frigates and destroyers will provide air defense to the tank transports, so ROC should probably get a few more submarines so that they can destroy more ships simultaneously. Without US support, I suspect Taiwan is lost. Would not surprise me if the unspoken strategy for Taiwan is a massive attack on the dam system of China. Is it worth it to China to try to gain militarily what another few generations of demographics will yield peacefully?